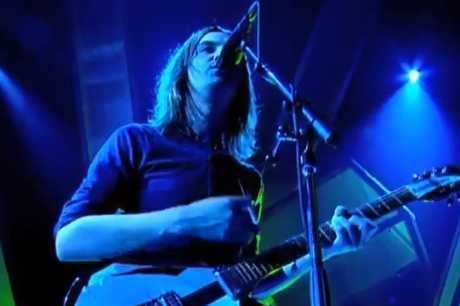 When allegations began to spread online earlier this week that Tame Impala were being accused of plagiarizing their song "Feels Like We Only Go Backwards" from Argentinian pop star Pablo Ruiz, we didn't report on it because we were skeptical about repeating unfounded accusations that stemmed back to a single website, the Chilean music page Rata. Sure enough, the accusers at Rata have admitted the whole thing was a joke, but it seems that Ruiz has upped the ante by allegedly considering legal action. The original article was posted on August 5, with an accompanying video that likened Tame Impala's hit to Ruiz's 1989 song "Océano." The melodies do bear a passing resemblance, but the songs themselves are nothing alike, and it sounds like something that could have easily been a coincidence rather than actual plagiarism. Hear the comparison below. Rata's editors, Raúl Álvarez and Patricio Pérez, admitted to Rolling Stone, "It was a joke. We were at a party and had that idea. Curiously, it was viralized pretty fast. We never thought we'd had this impact, and we're very surprised about it." In a statement, Tame Impala leader Kevin Parker added, "This is a joke, right?" Ruiz, however, might not be taking it so lightly. He spoke with ESPN Radio Argentina [via Rata] and Google translates his comment like this: "Obviously there is a plagiarism. Not if they have done it on purpose or not, but there are seven bars that are equal to my song." He is reportedly consulting with lawyers. This being said, Ruiz also added that he was interested in performing with the band when they come to South American later this year, so perhaps that's a way to smooth this whole thing over. Álvarez and Pérez said, "Of course we think it's funny, but we hope there are no charges against Tame Impala. We actually like them a lot."